The process by which the Statute and the Catechetical Directory of the Neocatechumenal Way were approved by the Holy See was fraught with significant deviations from the normal protocols. These abberations cast doubt on the integrity of the whole process and put the Church itself at great risk. The following arguments are intelligible to anyone with a minimum of knowledge on the subject of deliberations. We imagine that we must follow up on any measure, by virtue of the decisions assumed in it. It is evident, then, that the determination in question can not diminish prior resolutions on the measure, unless it is a revocation or an correction of it (a correction that cannot override the delegations or powers that belong to others). The final approval of the Statute of the Neocatechumenal Way (NCW) did not happen that way. The “ad experimentum” decree of June 29, 2002, as promulgated by the Pontifical Council for the Laity, pro-tempore, provided: “The Way is implemented according to the guidelines contained in the Catechetical Directory of the Neocatechumenal Way. Orientations for the teams of catechists (cf.. Statutes, art. 2, 2), subject to the joint approval of the Congregation for the Doctrine of the Faith, the Congregation for the Clergy and the Congregation for Divine Worship and the Discipline of the Sacraments.” The joint approval was mandatory, since the Guidelines for the teams of Catechists involves doctrinal and liturgical issues, and also acts as a guide for the seminarians of the Way. For six long years, from 2002 to 2008, the Congregations for the Doctrine of the Faith and for Divine Worship and the Discipline of the Sacraments were officially silent. 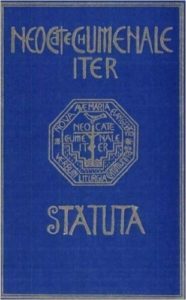 There were no formal decisions issued in compliance with the due approval of the Neocatechumenal catechism; subsequent correspondence between Pontifical Council for the Laity and Way (which are reported in the footnotes sources) show that there were none. Final approval of the NCW statute was granted by the Pontifical Council for the Laity in 2008. The Way, however, was implemented “according to the guidelines contained in the Catechetical Directory”. 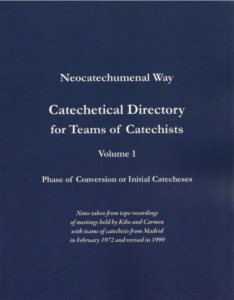 The Catechetical Directory, in turn, contained the celebrations of the Way: hence the need for joint approval of the aforementioned Congregations. Well, on May 11, 2008, six years after the “ad experimentum” decree, the Pontifical Council for the Laity approved the final status of the Way autonomously, although the Catechetical Directory still had not received any official approval from other congregations. The approval of the Catechism of Kiko Argüello and Carmen Hernández would come only in December of 2010, and not through the work of the Congregation for the Doctrine of the Faith (CDF). The CDF will report only to have it further viewed, provide a few corrective suggestions and will delegate the Pontifical Council for the Laity to approve it. For almost three years, therefore, the definitive Statute of the NCW regulated an itinerary of Catholic formation based upon the Catechism of two lay people without the necessary formal approval of all competent Congregations. The chatter that eventually occurred between these components was not publicly documented and the final status of the Way, for almost three years, was irrefutably invalid. The mess does not end there. 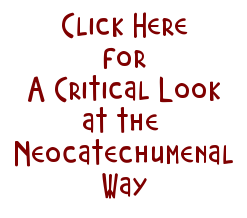 The Neocatechumenal catechism contained the celebrations of the Way. You could not approve the Catechetical Directory without first having approved the celebrations contained therein, a thing to be done with an appropriate formal act Congregation for Divine Worship and the Discipline of the Sacraments. However, it was the Pontifical Council for the Laity gave this usual notice when it announced on January 8, 2012 only that it had received a favorable opinion from the aforesaid Congregation for Divine Worship and the Discipline of the Sacraments. Once again, formally, it was the Pontifical Council for the Laity who approved “the celebrations contained in the Catechetical Directory and not regulated by the liturgical books of the Church“. Yes, that’s right: a cardinal member of a congregation did not even know about the consultations. We know the result: Pope Benedict XVI gave the reason to Cardinal Burke. From May 2008 until January 2012 (but even before, given that the Guidelines for Teams of Catechists had no formal approvals) the Neocatechumenal Way has operated with a statute characterized by substantive defects, with glaring deficiencies remedied retrospectively twice, with progressive logic like “nunc pro tunc” (“now for then”). The final approval was given without even the knowledge of Cardinal Burke, Prefect of the Vatican Court and member of the same Congregation which was entrusted with the judgment. Benedict XVI, however, made it clear: the observations of Cardinal Burke were judged “very fair”, the Neocatechumenal Catechetical Directory are intended to be approved only those parts that “are not strictly liturgical.” This thing is different from the direction of the Pontifical Council for the Laity’s approval of “the celebrations contained in the Catechetical Directory and not regulated by the liturgical books of the Church.” If in the Neocatechumenal Catechetical Directory – still kept secret from ordinary mortals – there are liturgical celebrations as evidenced by the dispute, the approval of the Directory is unlawful and the illegality is reflected on the Statute, which is to implement the Way following the guidelines contained in the same Directory. Was it caused by a similar sequence of delays of approvals and disapprovals? Friendships, collusion, carelessness? Posterity will judge; the documentation of facts and dates can only be analyzed by us with reason: “paper sings” and the numbers are not subject to interpretation. And we cannot avoid evaluating the reason: the final status of the Neocatechumenal Way was granted despite being of no effect, based on a Directory that was not yet approved, for liturgical celebrations contained in it, which never would have been [approved], at least by Benedict XVI.